Extra marshmallows, premium butter, a splash of vanilla extract, and plenty of sprinkles. That’s how I like my Rice Krispie Treats, and I think you’re going to love this gourmet twist on this classic treat, too! 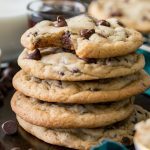 I love a good classic recipe, but even more than that I love a new twist on a classic (which you’ve maybe picked up on if you’ve seen my chocolate chip cookies). 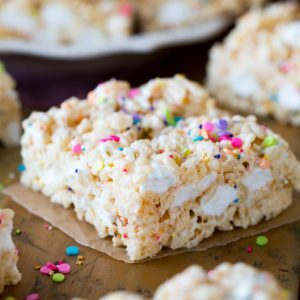 These Rice Krispie Treats are a classic re-done, I’ve made a few changes to upgrade this recipe to something much more gourmet. 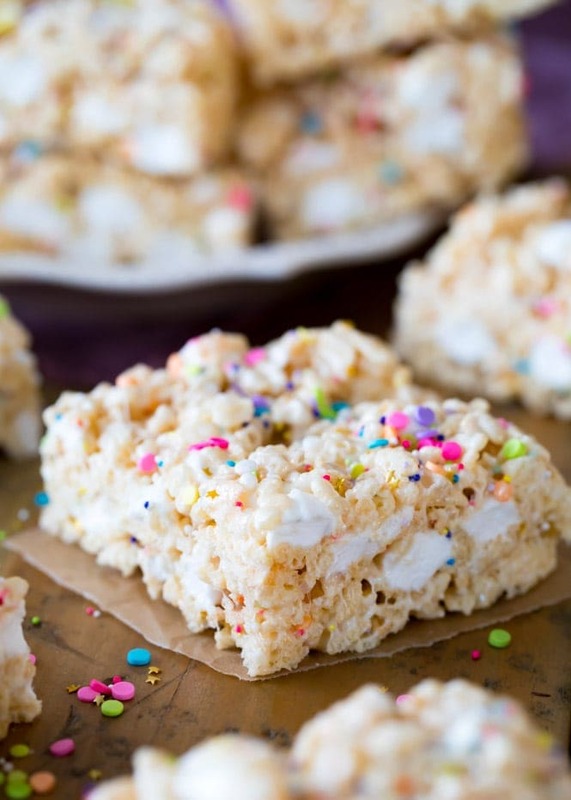 Extra butter, real vanilla extract, and plenty of extra marshmallows take these Rice Krispie Treats a notch above what you’re used to, and once you try these there’s no turning back. 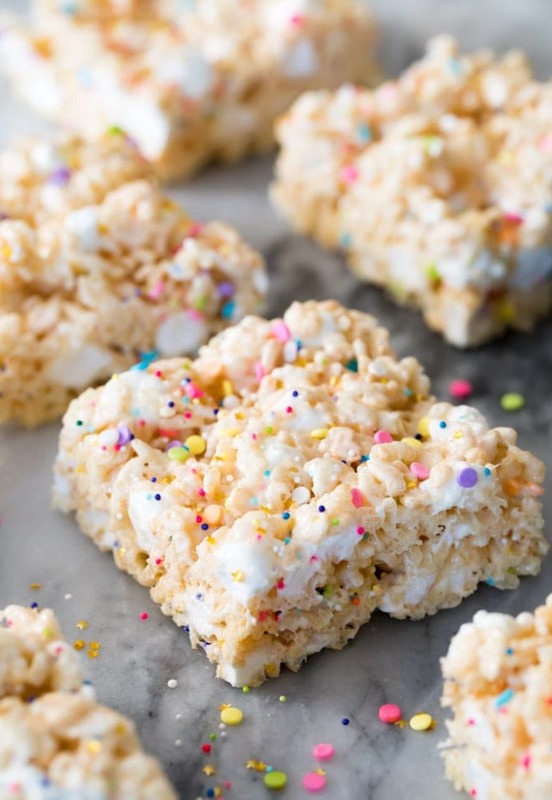 As you may have noticed, I also added a handful of sprinkles to my Rice Krispie Treats. I love the color and texture that they add to these treats, and they can be easily customized to accommodate the color of the upcoming season (for example, Valentine’s Day colors!). I used a lot of nonpareils here, but Zach doesn’t like the extra crunchiness of them. Regular sprinkles/jimmies would be less obvious, so use whichever best suits your own preferences (of course you could also leave them out entirely!). I really recommend using European butter here for the best flavor. European butter is more expensive than your standard butter but since these rice krispie treats require so few ingredients, I do think that using a quality butter makes a notable difference, and this recipe uses significantly more butter than the classic Rice Krispie Treat recipe, so all the more reason to upgrade your butter for an upgraded Rice Krispie Treat! Unlike many of my recipes, I also recommend using a salted butter, rather than an unsalted one. Another big change with this recipe is that we are using a lot of extra marshmallows here. I love the soft chewiness of the mini marshmallows against the crisp cereal, and as you can see from the photos there are a lot of mini marshmallows to be seen in the finished product. You’ll initially melt some marshmallows, then add another half of a bag right along with the cereal, stirring until they just begin to melt. European butter is a plus, not a must. 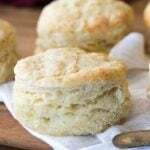 I love the flavor that it adds to baked goods and highly recommend using it here, but this recipe will also work with regular salted butter. Keep the heat on low, or below medium-low. Have you ever made an indoor S’more in the microwave and ended up with a marshmallow that was hard enough to break your teeth on? Well, that’s what will happen if your marshmallow is exposed to heat that’s too high, so keep the heat on low to avoid rock hard rice krispie treats. Add the sprinkles last and stir with a gentle hand, otherwise the color could bleed as you’re stirring them in. Don’t cram the rice krispie treats into the pan, gently spread them evenly into your prepared pan. 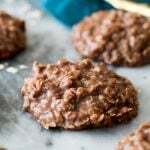 If you pack them in too tightly then they could end up too dense, I like mine softer and chewy. When my grandmother would make rice krispie treats, she would just loosely spread them across a full-sized cookie sheet, no packing in at all. They look a little less uniform that way, but that’s definitely an option here, too! Do Rice Krispie Treats Need to be Refrigerated? Nope! I actually recommend that you do not refrigerate your rice krispie treats for best flavor and texture. 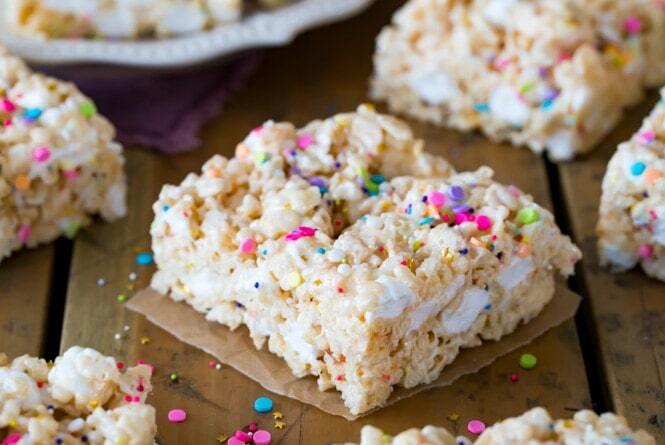 My favorite Rice Krispie Treats! 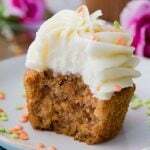 Extra soft and full of marshmallows and sprinkles! 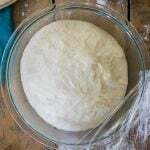 Line a 13x9 pan with wax paper and set aside. Place butter in the bottom of a large saucepan over medium-low heat. Stir occasionally until butter is completely melted. Add 10 oz (one bag) of marshmallows and stir until just melted. Keep your heat below medium and stir frequently, this will take a bit of time for the marshmallows to melt but too-high heat can cause your rice krispie treats to come out too hard. 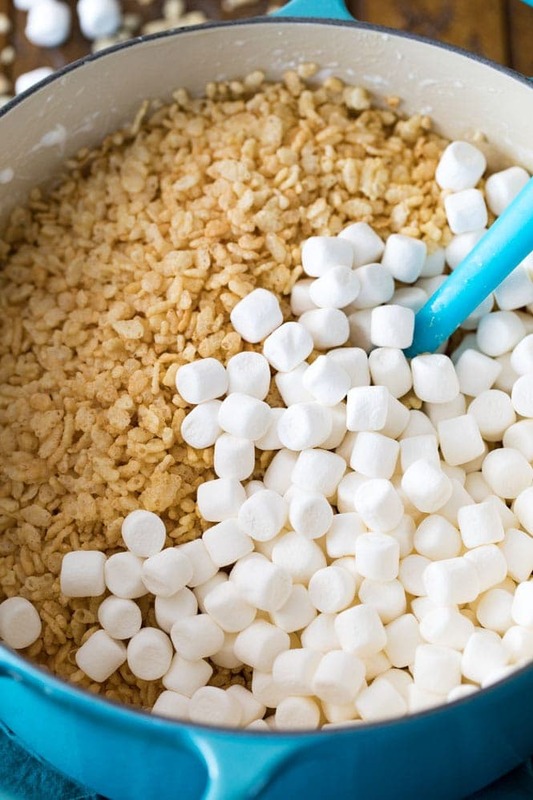 Stir in vanilla extract, and then add rice krispies cereal and remaining marshmallows. Stir until ingredients are combined and additional marshmallows are just beginning to melt. Scatter sprinkles over the mixture and briefly stir to combine. 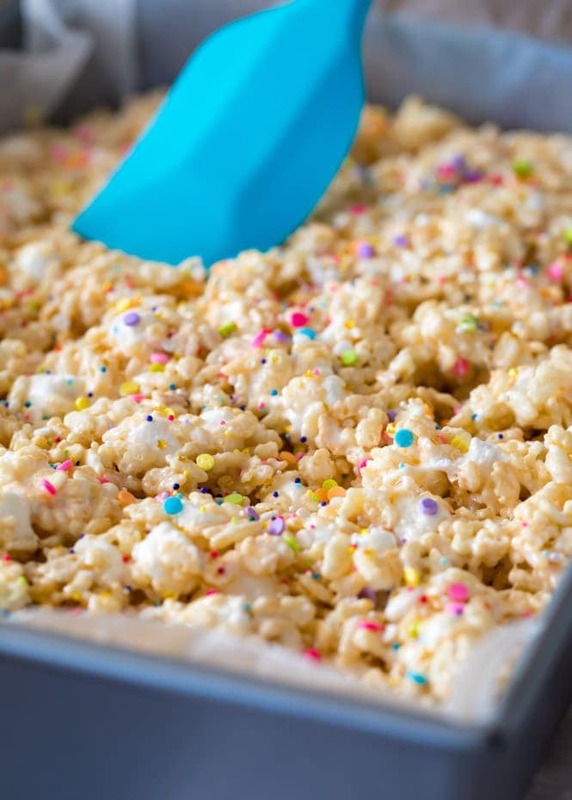 Immediately transfer mixture to prepared 13x9 pan and use a silicone spatula or your hands to gently pat rice krispie treats down evenly into pan (don't over-handle them or this will also make them come out too hard). Allow Rice Krispie Treats to cool completely at room temperature before cutting and serving -- about 30-60 minutes. These were absolutely delicious at my daughters birthday party! I will never make Rice Krispie Treats any other way. Thank you so much for a recipe that was easy to follow with lots of helpful tips! Is it possible to use the regular size Marshmallows or does it have to be Mini ones because that’s all I have on hand? Was planning on whipping this up for my daughter’s school party. Thanks! So delicious!! Soft and gewy and flavorful. I didn’t think I would like the extra marshmallows but they’re my favorite part! Thanks for the wonderful recipe and the tips! Lower heat really makes a difference. I’m not an avid baker so I had no idea. We made these last night and they turned out great! Hi Sam, just made some of your Rice Krispies Treat and they are delicious. I will stick with the nonpareils, since the jimmies tend to melt. 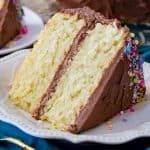 It’s a great recipe for desert moldings. ( forming edibal castles ,people, ect. ) 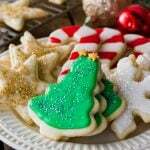 working well with cake sheets, confections, and cookie forms . Creating detailed edibal art.. thanks. I used fruity pebbles it’s also delish. Thanks for the recipe! Yum, I’ll have to try with Fruity Pebbles! Thanks Tammy! Thank you for the awesome idea! After searching high and low for a gourmet rice krispie treat, I found that yours was simple and delicious! I am actually using this for my demonstration speech for my communications class! I an looking forward to trying this receipe for a ladies’ weekend retreat. 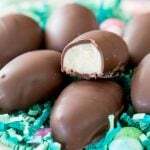 Can I make these a few days ahead of time and still have them chewy? 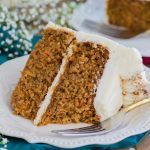 I recently tried this recipe, and now I’m obsessed!!! I used regular salted butter, I couldn’t find European butter. This is now my go to recipe. In fact, I’m making them into hearts for Valentine’s Day! Thank you for sharing. 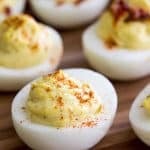 What was the name of the brand of butter that was used for this receipe? Any common grocery stores that would have the European butter? Not having any luck. You can use Kerrygold or Finlandia or you can use Land o’ Lakes or Challenge so long as the label on either of those indicates that it is “European style”. 2 of my 3 local common grocery stores carry the European-style butter, but my local Walmart does not. Raleys, bel air, nob hill stores all carry The European butters. I have been adding the vanilla to the original recipe for years. What a difference it makes in the taste. Love all your recipes. Keep them coming. 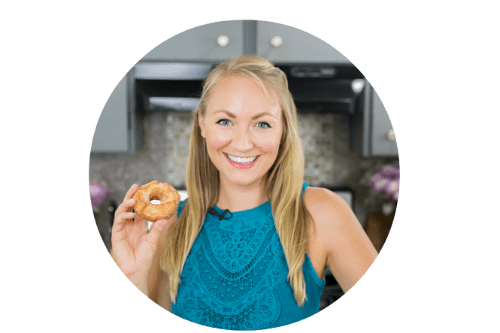 I’m so glad to hear you are enjoying the recipes! Thank you for commenting, Lucille! “Unlike many of my recipes, I also recommend using a salted butter, rather than a salted one.” seems contradictory. I think it should be “rather than an unsalted salted one”, right? Yikes, YES you are right! Fixing that now, thank you!! I have found that putting them in the fridge makes them too hard to cut or chew.